It has always been Jacques' passion to experience the end result and effects of various clones of grape varieties, as reflected in the wine. 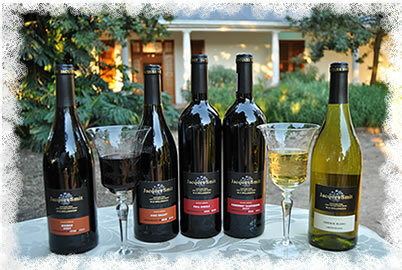 As Welvanpas, the cultivar range of grapes comprises of Cabernet Sauvignon, Shiraz, Chenin Blanc, Cape Riesling and the relatively newcomer, Roobernet. Here they decided not to fight nature and tend to let things go according to the climate, which makes Wellington so well suited for viticulture nursery production. The Welvanpas grapes mature at relatively high sugar contents, thus higher alcohol levels, but with the complexity, flavour and inherent "richness", which is characteristic of Wellington wines. It has been said that Wellington is one of the best kept secrets in South African wine circles. Jacques claims an all time first in making Port from Roobernet and he plans to have another surprise up his sleeve shortly. His red blend, namely Cabernet Sauvignon/ Shiraz, is aptly called “Vine Valley” after the vine nursery industry in Wellington. It his motto not to add a wine description to his wine labels. Jacques believes that wine lovers should have the pleasure of discovering for themselves what nature has put into their glass.